In September of 2003, Deborah Thomas (Swanilda73 at aol.com) came into possession of some of her father's genealogical papers. Among these items, she made a wonderful discovery. Her father's cousin from the "Young" side of the family had written him a letter and in that letter had included a photocopy of the "Births" page from a family Bible. The births were from the family of Rev. John Vought Bodine (b. Oct. 20, 1842) and his wife Margaret Hughes Kern (b. Sept. 14, 1845). 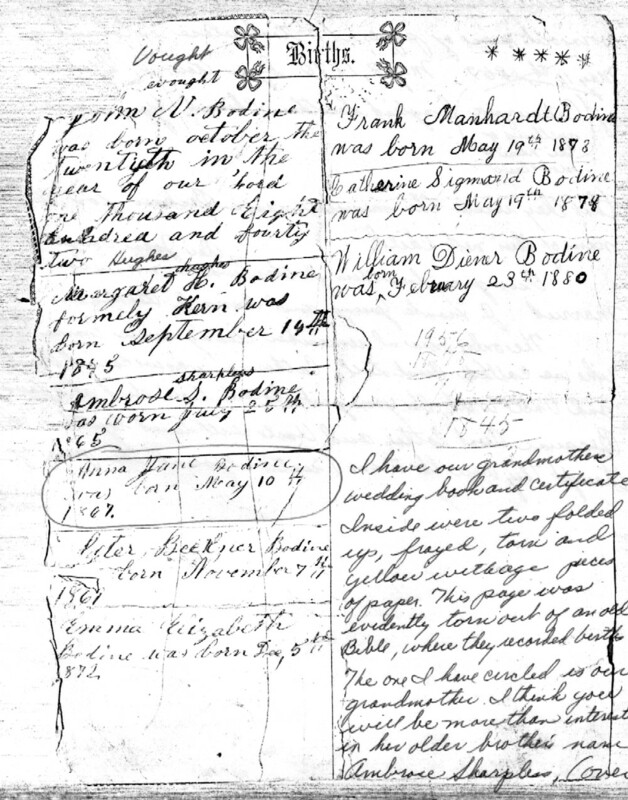 They had seven children whose births were recorded on that page. My thanks to Deborah for making this valuable find available to all. As I mentioned, the one page of the Bible I have info on only lists some births. Here is what the Bible says. The spelling is as written in the Bible. See further below for more notes on this information. Click on the word "BIRTHS" below to see an actual image of the Births page. Note: The last date does appear to say "23th" and not "23rd". This is not an "8" that looks like a "3." It must have just been a mistake; although, one might want to maintain a little doubt about this date. I have our grandmother’s wedding book and certificate. Inside were two folded up, frayed, torn and yellow with age pieces of paper. This page was evidently torn out of an old Bible, where they recorded births. The one I have circled is our grandmother [Anna Jane]. I think you will be more than interested in her older brother’s name, Ambrose Sharpless. Our grandmother’s Baptisimal Certificate was the other "worn out" piece of paper. It took place in Columbia, PA, May 8, 1870 by a Rev. D. Beckner, Pastor of Catawissa English Southern Church. You will notice that they used the minister’s name Beckner for the middle name of their next child. Our grandmother’s father, Rev. John Vought Bodine, was a minister and he married J. Frank Young and Anna J. Bodine. The only ones I remember clearly were Emma Elizabeth who we called Aunt Till, Catherine, who we called Aunt Cottie, and Uncle Will, the youngest. Cottie’s twin died of a young age. Because Aunt Cottie and Uncle will lived together, I always thought they were the twins (until I found this piece of paper).